Teleophthalmology is a branch of telemedicine that delivers eye care through digital medical equipment and telecommunications technology. Today, the applications of teleophthalmology encompass access to ophthalmologists for patients in remote areas, ophthalmic disease screening, diagnosis, and monitoring as well as distant learning. Teleophthalmology enables health professionals to take ocular images and attend to patients who have limited access to ocular healthcare. These images allow the ophthalmologist and other health-care professionals and researchers to carry out the aforementioned applications. The required equipment includes a fundus camera that can take ocular images and a computer terminal with network capabilities, which can transfer the images. There has been a significant increase in teleophthalmology applications over the past decade. However, differences in health information exchange standards, data security, liability issues, and cost of equipment are other major challenges in teleophthalmology [Figure 1]. Having spent over a decade as practising ophthalmologists, we thought that there was a dire need for innovation in India's eye screening space. In India, there are nine ophthalmologists for every million people, as compared to the US where there are 81 ophthalmologists for every million people. Moreover, in the coming years, 70 million people are likely to be affected by diabetes, of which one in every four people will have diabetic retinopathy; this led us to turn health-care entrepreneurs and setup, an affordable eye screening organization. Through our organization, we are identifying solutions which are innovative and can reach out to the population on a large scale. 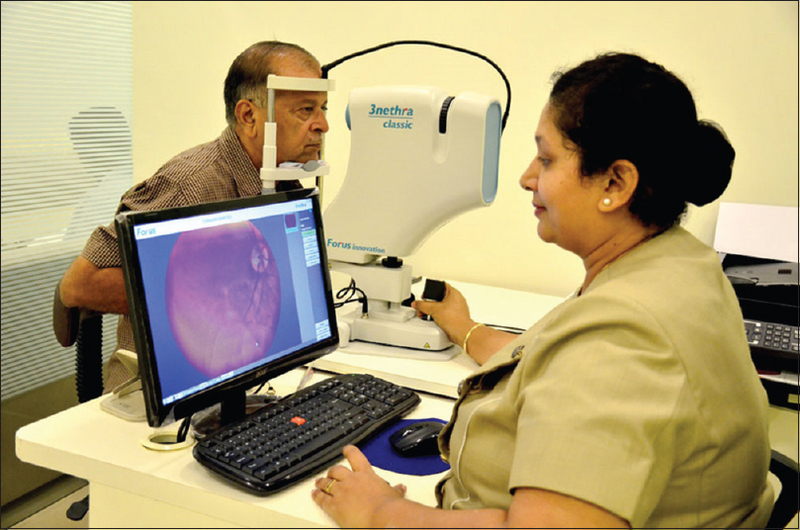 The Chennai-based organization partners with diabetic clinics, general hospitals, ophthalmologists, and testing centers (laboratories) and sets up a nonmydriatic fundus camera, which captures an image of a patient's retina at the point of contact. Then, through a cloud-based device, the image gets transferred to the back-end team, which includes the ophthalmologist, who prepares a report and sends it back to center. Once the center receives the report, the diabetologist advices the patient accordingly. Ultimately, our aim is to work closely with the diabetic centers without affecting the workflow of the clinic. Patients who are detected with retinopathy have the choice to go back to their own ophthalmologists. Welcare, hence, increases the number of patients who go to local ophthalmologists and is works in collaboration with the ophthalmologists [Figure 2]. Asynchronous teleophthalmology in a “store-and-forward” method where data are captured and transmitted for review at a later time. Images of the eye can be captured noninvasively through various methods, generally by a technician or nonphysician health-care professional. Posterior segment or retina: Fundus camera. We use asynchronous teleophthalmology in 80% of cases, wherein images are stored in our secure server and doctor's login and report within 30 min [Figure 3]. Patients who request to speak to the ophthalmologist are provided a slot for video consultation. Patient education is possible when patients are able to see their own retinas and changes which have occurred due to diabetic retinopathy. Every ophthalmologist is looking at ways to improve his practice, and telemedicine can definitely help in improving one's own practice by giving access to new patients. We invite ophthalmologists to become partners with us, and through our model, we can reach out to patients in general hospitals and diabetes centers. Local ophthalmologists can get more patients using video consultations. Hence, the idea is to make every single ophthalmologist in India into a telemedicine practitioner. Teleophthalmology need not be restricted only to larger institutions; it can definitely be used by small independent eye doctors too. Teleophthalmology is an exciting new technology which can help in integration of all urban and rural health-care centers in India and improves the quality of medical services in the presently underserved and impoverished sections particularly in remote rural areas of developing countries like India. Please contact the authors if you wish to know more about incorporating teleophthalmology in your practice. The authors certify that they have obtained all appropriate patient consent forms. In the form, the patient(s) have given their consent for their images and other clinical information to be reported in the journal. The patients understand that their names and initials will not be published and due efforts will be made to conceal their identity, but anonymity cannot be guaranteed. Goldschmidt LP. (2012). Digital Teleretinal Screening Teleophthalmology in Practice. K Yogesan, J Cuadros (eds.). Berlin, Heidelberg: Springer Berlin Heidelberg.